After 20 years at the top of its game, the Buster L is in line for a well-deserved upgrade. Alex Smith investigates the new ‘L Pro’ model. 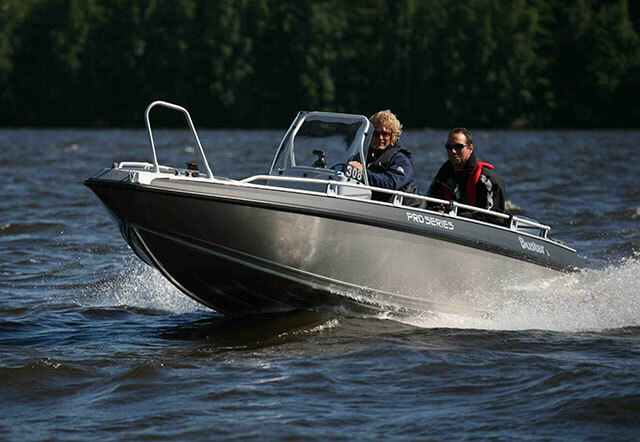 The Buster L has been one of the most popular powerboats in the whole of Scandinavia for the last two decades, so it makes sense for Fiskars, the Finnish builders, to lavish some attention upon it. Extra-thick aluminium alloy used to build the L Pro further strengthens the already formidable – and popular – Buster L range. Given its extraordinary success, they would of course be unwise to deviate too far from the winning formula, but there are some notable improvements on the new L Pro model that might well see it ramp up the public’s enthusiasm yet further in 2014. 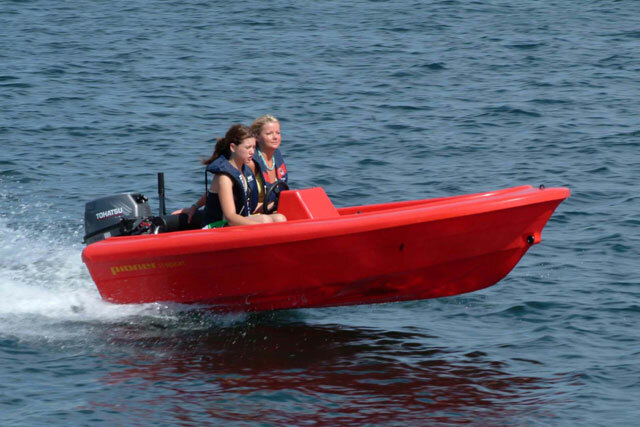 What makes the new boat different? The new Buster L Pro is the smallest of the four models in the high-spec Pro series and its configuration is usefully simple. 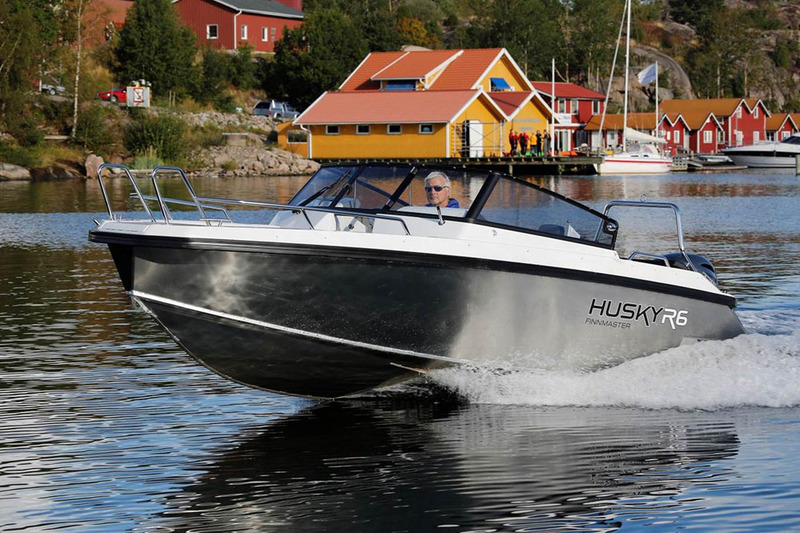 In addition to a full-length wraparound guardrail, a removable aft bench unit and a step-off bow with built in locker, all you really get is a compact centre console with a single Skipper’s seat. In addition to the extra millimetre of hull aluminium thickness, the deck is also of metal instead of wood. This generates plenty of space on every side of the helm for the kind of movement and stowage demanded by serious fishermen and professional users. And better still, this extra deck space is usefully exploited by the versatility of layout provided by Buster’s portable screw-down polyethylene seat and storage boxes. These enable you either to put to sea with a completely empty deck or to install the units in a pattern that suits your needs. All you do is reach inside the box and rotate the finger-wound screw heads to anchor the unit to integrated runners in the deck. Of course, we’ve seen this plenty of times before from Buster, there is no doubt that the L Pro has been designed to be just that bit more flexible and that bit more adaptable than any of this famous model’s previous incarnations. Aside from the extra versatility of the deck space, the other key difference on the L Pro is the additional solidity of build. 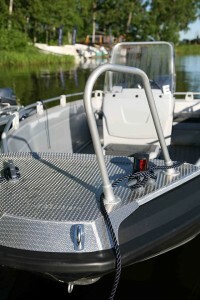 While all Busters come with the inherent strength, rigidity and long-term durability that marine aluminium brings, here, the new Pro series uses 4mm alloy (instead of 3mm) in the construction of the hull, plus metal check-plate for the deck instead of plywood sections coated with rubber paint. 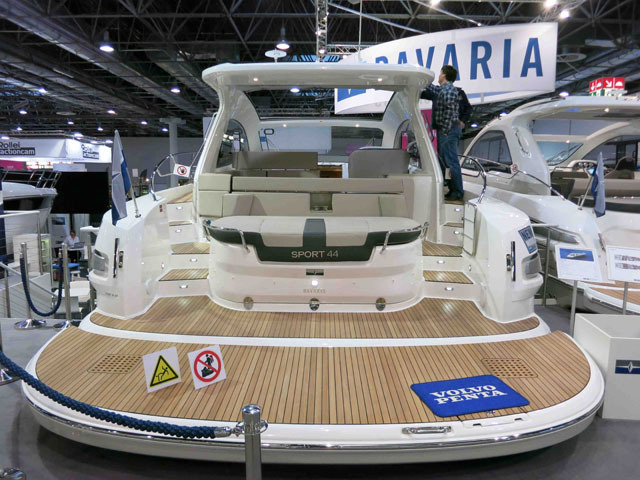 It also uses slightly more robust fittings – not least in the bow locker, where the entire unit is constructed from the same powerful material as the deck. However, despite its impressive strength of build, a bare weight of just 390kg (only 50kg more than the standard L) means that the L Pro can still be transported on a brakeless trailer with nothing more than a small, low-powered family hatchback. 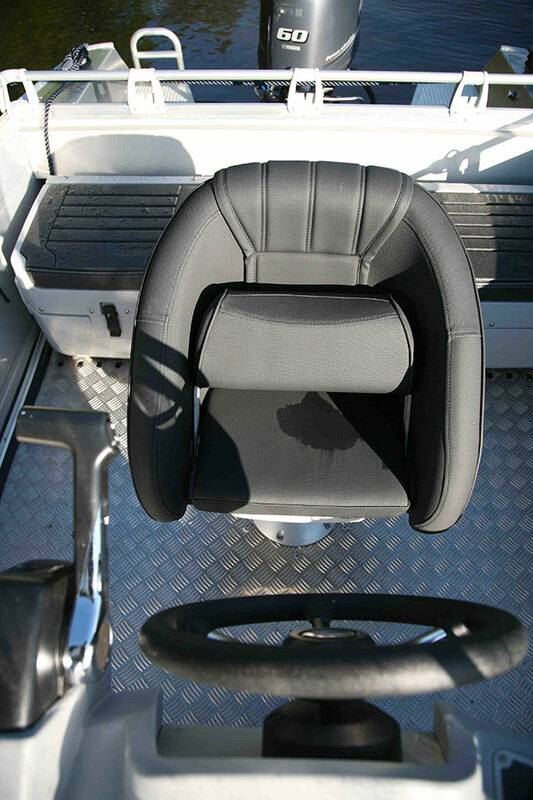 The level of comfort offered at the helm station is not matched elsewhere on the boat without resorting to the optional extra cushions. Under way, a combination of the extra weight and the greater strength of the Pro model brings a useful softening of the ride. In fact, our Skipper for the day is so proud of its softness that he considers the optional cushion package entirely unnecessary. It’s a bold standpoint and there’s no doubt that the ride is very commendable but he is entirely wrong in this regard. While the helm is impressively comfortable, the impacts through that rigid aft bench are impossibly urgent and would become pretty unbearable over any distance if the seas got lively. In short, if you like the L Pro, you should consult the options list and make the cushion package a priority. Aside from that, all is much as you would have it. The rotation-moulded polyethylene console is strong and protective, the driving ergonomics are sound (both standing and seated) and the running efficiency is very impressive. Though the basic L is frequently specced with anything from 30 to 50hp, the Pro model enjoys an uprated spectrum of 40 to 70hp - and the midrange Yamaha F60 puts together some very impressive figures. While our top end is a perfectly acceptable 31 knots, a gentle cruise of between 15 and 20 knots cuts the fuel flow figure by more than 50 per cent. 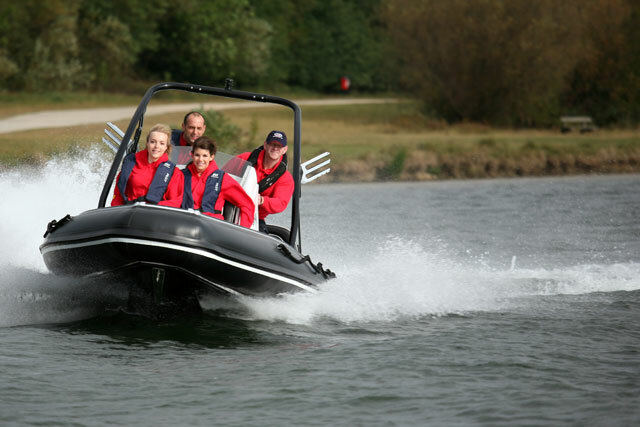 At these speeds, we are burning just eight to ten litres of fuel per hour - and even with quite a small fuel tank of just 53 litres, that still gives us a range in the region of 100 nautical miles and a price for our entertainment of less than £15 per hour. Certainly, the top-end F70 would offer a little extra grunt from the same 996cc block and it would do so without much deterioration in fuel economy, but with markedly similar performance figures, it remains difficult to justify the extra £900. For me, the F60 shows itself to be the most complete all-round solution for the new L Pro. The basic Buster L (which is driven from the aft bench) and the more involved Buster Lx (which features a pair of ‘Twin Console’ style seating units) will continue to appeal to the buying public in the same way as they have done for 20 years. However, the addition of the Pro model will create a fresh dimension to this key section of the Buster fleet. 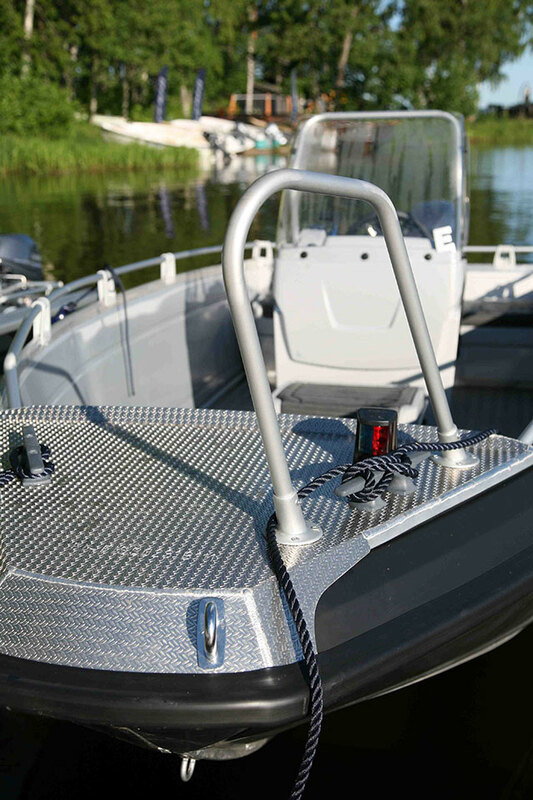 With more substantial construction, greater versatility in configuration and a higher transom rating, it is basically a Buster L with some modest but worthwhile upgrades. Given what has gone before, there is nothing especially bold, outlandish or revolutionary here but you really wouldn’t want there to be. This is simply the sage and subtle upgrade of a phenomenally successful boat. Scandinavian powerboats feature regularly on www.boats.com. 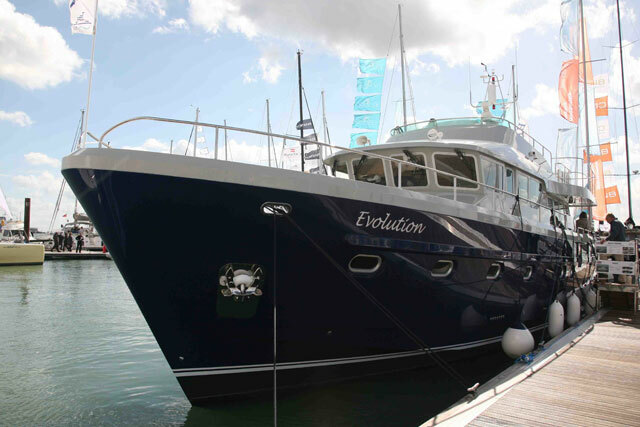 Take a look at Ocean Master 630 WA: Entertainment from the Driving Seat or Minor Offshore 25: A Four-Season Walkaround from Finland. Search all Buster L, Buster Lx, and Buster L Pro for sale worldwide on www.boats.com.